It is freakishly beautiful in Austin today. 70 degrees, clear sky, low humidity, a stiff wind. Went to Auditorium Shores with the dogs. Lucy was like a little black comet, flying all over the place in large elliptical orbits. 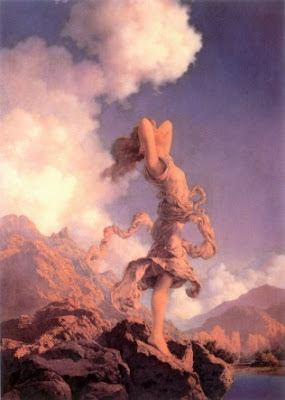 It is a Maxfield Parrish kind of day. Despite what I understood to be a general snobbery concerning Parrish's work, I used to keep this poster on my wall in college. It was nice to have a bit of Parrish sunlight to remind you of days like today. Blogging will recommence when it is not sunny and/ or very, very nice outside. Sorry about the lack of blogging. I was back at College Station again on Tuesday. Its been a busy week already. After several months of working on his grad school applications, he's now hit "submit" on the form. He's applied to a serious Research 1 university or two, and these days, that's a lot more than merely filling out a bubble sheet with your GPA. The League is actually very interested in seeking graduate education himself in the next few years, and so we're watching Steven with marked interest. We've both been rejected by good graduate schools and accepted by less-good graduate programs. And actually walked away from a graduate degree a few years back when we had a moment of clarity and realized we did not want the degree nor career path we were headed towards. We hope to once again actually feel its okay to not tempt Steven and Lauren with distraction. But it occurs to us that its now all the more pressing that we get as much Steven and Lauren time as possible fit in as we may be losing them come the fall. Hmmm. That seems like a poor option. I was going to write something kind of mean about the events in Stamford where a woman was attacked by her friend's chimp. Maybe because I was raised with extremely mild-mannered dogs, as well as animals that were just as happy to bite me as take a meal (see: Perry the Python), and gerbils, fish, turtles and whatever... I've always appreciated dogs in particular for their easy ability to fit into a human lifestyle thanks to their deeply embedded pack mentality. If my cat, who I know loves me (if sleeping by your head and purring loudly isn't love, I don't want to be right), but occasionally goes nuts and does something dumb, like attack my foot or whatever... what on earth makes people think that keeping a 200lb chimp around the house isn't going to eventually end in disaster? Or the story or two that comes up every year of someone with more money and machismo than brains whose tiger escapes its backyard enclosure and mauls either the owner or some unsuspecting neighbor. Human fear and ideas about justice almost invariably lead to the animals being put down for doing what animals do. Which is always marked down as "suddenly unpredictable", when that's pretty much what most animals are. If they weren't, we'd all have pumas and pandas in our houses. I'll never know what possesses people to feel they can or should put others at risk for what seems to be vanity or misplaced belief that they're The Beastmaster. I strongly suspect it has something to do with how far we're removed from a world in which we have a legitimate fear of being eaten by wolves and bears. I have to give a shout out to both JMD and RHPT, who always send me good stuff via e-mail. I don't often post those items, but I am publicly saluting you. 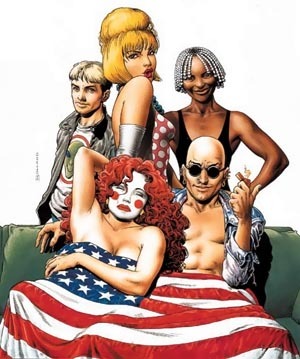 Countdown to "media critics" freaking out about Watchmen. Anyone who spends more than 2 or 3 days at my house will see I watch an alarming amount of Austin's 24-hour news channel, News8Austin. Its all local news, weather, sports, events, etc... And its run the way I think a news channel should be run. It's mostly commentary free, unless they have "commentator" below someone's name, and the anchors and reporters don't freely editorialize. But its also a small, shoe-string-budget operation where reporters build their portfolio or settle into News8's somewhat odd culture of "Pet of the Week" installments and showing up every time someone puts more than three folding chairs outside and rents a microphone. This weekend they were taping the Austin Marathon (which may or may not have featured JAL), when photographer Eddie Garcia caught something entering the atmosphere and seemingly burning up. You can watch the video here. Some speculated that it was part of the satellites which recently collided in orbit. NASA has dismissed all that. They say it was maybe a meteor. Well, Leaguers. That was me. Its a little difficult to explain what I was doing in the ionosphere in the first place, but let us just say that wrongs needed righting, and I could not let the schemes of my nemesis, Dr. Nefario (aka: RHPT) come to fruition. Indeed, the fate of the world was at stake. So, yeah, that's me and Lucy heading back to planetside. I didn't know I lit up like that on re-entry. Neat! Due to an excellent suggestion by the League's own JMD, we now have a new category! 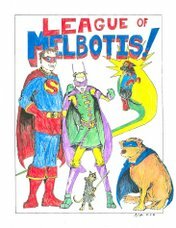 "Li'l Leaguers" will mostly be about superhero and sci-fi stuff such as books, videos, etc... your kids may enjoy. It will probably also occasionally dole out advice on what you may want to avoid as a cautious parent looking to delve into superherodom. Li'l Leaguers: Superman and Batman in Kid's Books! Hey, I know there are a lot of Leaguers out there who've got young super-heroes of their own. It seems Stone Arch Books is publishing a line of children's superhero books featuring The Man of Steel and the Caped Crusader. Art is in the style of the JLU/ Bruce Timm animated format. If you buy them and need help pronouncing villain names like Mr. Mxyzptlk, just lemme know. I would have freaking LOVED these as a kid. I want to salute the guys at ComicBook.com. 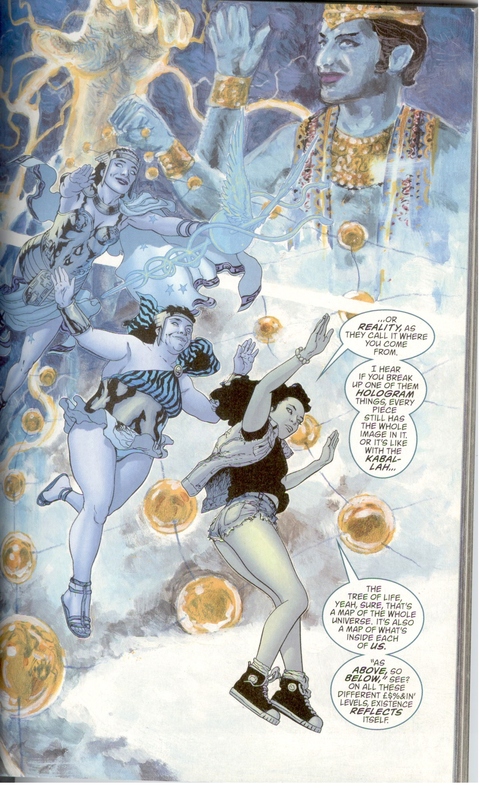 They're building a new site and are picking up RSS feeds from comic-related websites and blogs. Rather than merely grabbing my RSS feed, they actually wrote me and asked if it was okay. It is more than okay. I am pleased to see some people with some basic manners working on a comic-related site. So, unless they suddenly do something awful, the guys at ComicBook.com are officially blogrolled here in the Comic Links section, and they have my salute. Go click on their site and see what's what. Should be interesting to see how it goes for these guys. Valentine's Day was nice. Jamie and I don't do much for the day, partially because I'm a little cynical about the industry that seems to double in size every year around the holiday, and partially because (after 13 years of together-ness) I don't think Jamie wants any of the stuff you get at Walgreens. And neither of us want to go to some restaurant and stand around waiting for a table in unpredictable weather for two hours. We stayed home and Jamie made a wonderful meal. And we got to spend the holiday with Lucy Goose, who was kind of up in our grill because she'd been smelling the spaghetti-preparations all afternoon. Jamie got a card and a few candy-related items from me. Some of which Lucy Goose got into and ate last night. So... there's that. Today was pretty darn lazy. Took Lucy to the park to run her for a while. She Almost immediately lost her ball when she became distracted. It was sunny, 72 and breezy today, so the park was packed. The past two times we've been I became a little misty eyed as I know how much Mel loved it there, and both times, Lucy has run up to dogs who share Mel's silhouette from afar, only to stop short a few feet from the other dog when she realizes its not him. I, myself, was a little sad when I said hello to a Golden who wasn't quite as big as Mel, but shared his same, broad shoulders and thick, mid-winter coat. Hit a little close to home, which was odd, because it was triggered completely by touch. When we got home, I grilled up burgers and Jamie and I watched the end of Star Wars Episodes I and II, and as its been years since I'd watched either one, it was mind-boggling how bad those movies really are. I did some chores and then headed over to Jason's for a while where Reed, Jason and I played some music. Its been months since I picked up my bass. Honestly, I'd sort of decided it was going to find a home in the back of a closet somewhere or under the bed, but I had a great time this evening. So look for future tours of the band I was informed would be named "Reed, Jason and Platypus".